When I first heard about the Okinawa Aquarium, I knew that it was a place I would some day visit. Thanks to Chase Ultimate Rewards points, we were able to fly to Okinawa for free. 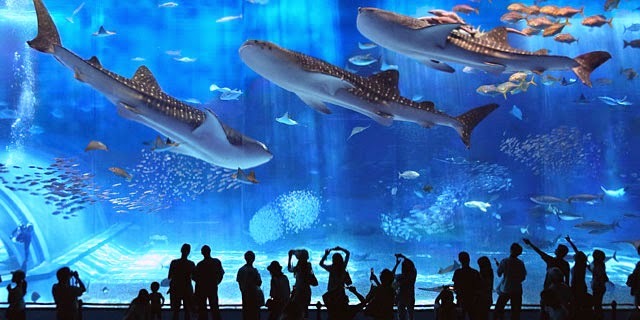 Prior to 2005, this aquarium was the largest one in the world (now that title goes to the Georgia Aquarium) and for a while, the only aquarium that kept whale sharks in captivity. “Chura” in Okinawan dialect means “beautiful” and there is absolutely no doubt that the Okinawa Churaumi Aquarium is the most gorgeous aquarium that we have had the chance to visit. The aquarium has 77 exhibition tanks, 80 species of coral, and thousands of different fish species. The Okinawa Churaumi aquarium is located inside the Ocean Expo Park, a 3 kilometer (1.86 mile) wide area where you can experience Okinawa’s history and culture. There is a Culture Museum, a Native Okinawan Village, botanical garden, arboretum and a sand beach where you can play and swim in the ocean. 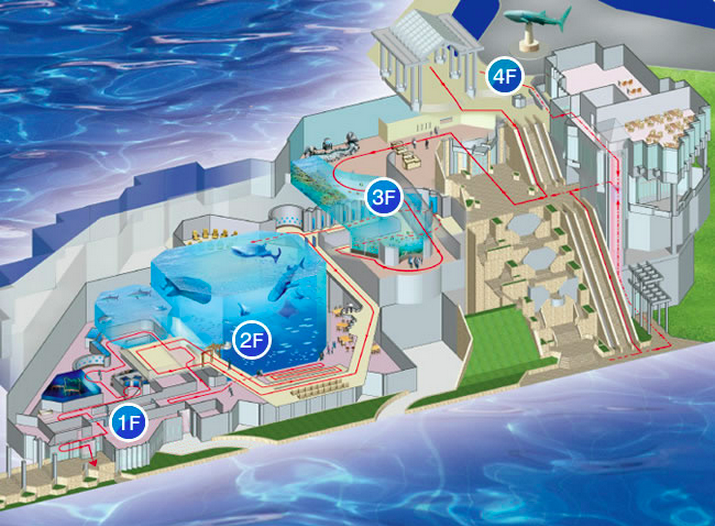 There is no charge to walk through Ocean Expo Park, and it is so large that there is shuttle service you can buy tickets for that take you from one side of the park to the other side. There are dolphin, manatee and sea turtle exhibits you can view for free. You start at 4F, where you are greeted by a large whale shark statue and have a chance to get an above ground look down into the open-air Coral Sea and Sea of Tropical Fish tanks. You start above water at 4F, and then explore the shallow coral reefs at 3F, the main open ocean at 2F, and then journey into the deep sea at 1F. It’s almost like diving into the ocean yourself as you slowly work your way through the exhibits. We enjoyed the easy to walk through design of the aquarium. It just made sense where to go next. I have never seen some of these unique fish species. We enjoyed watching the fish feeding. Multiple whale sharks, manta rays, and many other types of fish are kept in the main tank of the aquarium called the Kuroshio Sea, after the black current that nurtures the Okinawan seas. This humongous tank holds 1,981,000 gallons (7,500 cubic meters) of seawater. The first successful birth of manta ray pups in captivity occurred here. The whale shark is such a magnificent and beautiful creature. We were mesmerized by the feeding demonstration of the whale sharks, manta rays, dolphins, and fish. We saw Bull, Tiger, and Lemon sharks in the Shark Research Lab. In the deep-sea exhibits, we had a chance to view fish local to waters over 200m (656 feet) deep. The bioluminescent fish were very cool. The deep-sea giant isopods were disgustingly awesome. We loved our time at the aquarium. All of the exhibits are very well thought out and nicely presented. For those interested, there was plenty of educational information about the sea creatures provided. We even got to take home free fish picture atlas guides at each section of the aquarium. Tickets to the aquarium cost us 1,850 Yen each, for a total of 3,700 Yen or $31. We can’t wait to visit the Okinawa Churaumi Aquarium again!